Going Shopping Wooden Knob Puzzle is a great traditional wooden knob puzzle depicting a trip to the shops. 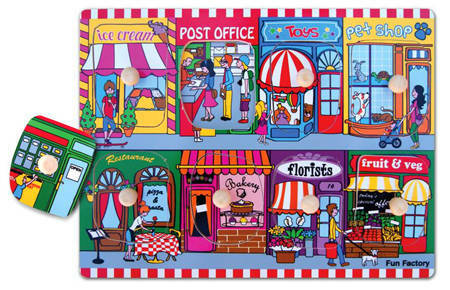 This puzzle has eight pieces which cover eight drawings of the inside of shops. Strong wooden knobs mean your little one can remove each shop front and reveal what is going on inside. This is lots of fun and the pictures are nice and detailed with plenty going on. We like this because: "Great fun to work out what is going on inside the shops and trying to remember who is where."